The TNI team's 2nd Annual Stuff-A-Truck event is happening today in Prince George's County. Food donations will help struggling families prepare for Thanksgiving. LARGO, Md.- Want to make a difference for families that need some extra help this holiday season? You can start by donating canned goods at a local event today. 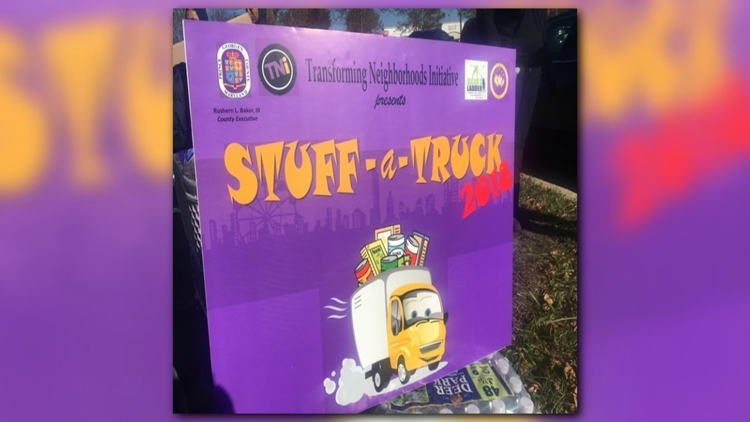 The Transforming Neighborhoods Initiative (TNI) in Prince George's County has teamed up with the Jacob's Ladder Youth Foundation, Inc. to host its 2nd Annual Stuff-A-Truck event. It runs from 9 a.m. until 2 p.m. at the Largo/Kettering Plaza Shopping Center. The county's TNI effort was designed to help communities that are facing significant economic, health, public safety and educational challenges. Jacob's Ladder is a faith-based non-profit that focuses on juvenile diversion and re-entry programs for youth and their families. Their mission is to reduce the number of youth entering and returning to the juvenile justice system. Last year, the team collected more than 1,800 pounds of canned and non-perishable food items during the first Stuff-A-Truck event. The donations helped 82 families provide meals. Food pantries were also helped by donations. This year's donations will do the same. If you cannot make it and would like to donate, please call 301-952-4690.